Ilaló is a long extinct eroded volcano located 8 kilometers east of Quito on a fertile green valley with a mild climate and temperatures. This volcano towers up in the middle of the valley right across Quito. It has a small caldera opened to the west which features very old lava remnants. There is a small lava dome to the south which is extinct as well. This entire volcanic complex has been covered on its whole by mainly ashes and debris from other volcanoes’ eruptions carried by the wind. In spite of being dormant Ilaló is regarded as a beautiful spot for hiking. How to reach: The north trail head can be reached from Quito by bus (45 minute-ride). 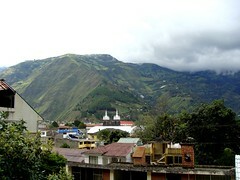 Views of the northern ranges all the way to the Colombian border are stunning. The south trail head: It goes by Andean paramour and nice tunnels through scrub. Views of Vulcan Cotopaxi as well as other peaks to the south are impressive."